Start off your visit on the 16th (Sat): view the masterpieces at Forestvale Design Centre. On your second day here, explore the wealth of natural beauty at South Bruny National Park. To find ratings, reviews, maps, and tourist information, read our Bruny Island trip planner . Newcastle to Bruny Island is an approximately 7.5-hour flight. 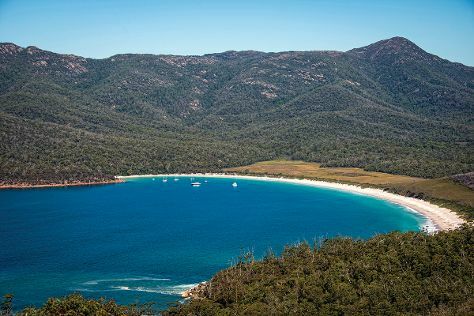 Prepare for slightly colder weather when traveling from Newcastle in February: high temperatures in Bruny Island hover around 26°C and lows are around 14°C. Finish up your sightseeing early on the 18th (Mon) so you can travel to Hobart. 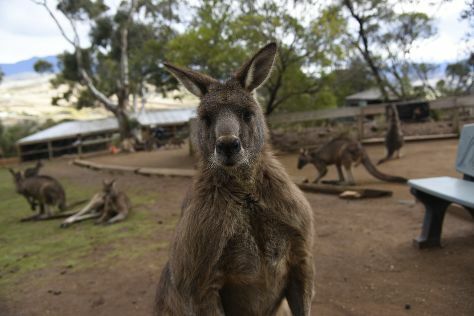 Step out of Hobart with an excursion to Bonorong Wildlife Sanctuary in Brighton--about 30 minutes away. On the 22nd (Fri), give your taste buds a day to remember with a local gastronomic tour. Spend the 25th (Mon) exploring nature at Hartz Mountains National Park. The adventure continues: take your sightseeing to a higher altitude at Mount Wellington, admire the natural beauty at Royal Tasmanian Botanical Gardens, get a taste of the local shopping with Salamanca Market, and steep yourself in history at Cascades Female Factory Historic Site. For traveler tips, ratings, maps, and tourist information, you can read our Hobart day trip website . Do a combination of car and ferry from Bruny Island to Hobart in 2 hours. Alternatively, you can do a combination of taxi, ferry, and bus. In February in Hobart, expect temperatures between 26°C during the day and 14°C at night. Finish up your sightseeing early on the 25th (Mon) so you can go by car to Port Arthur. 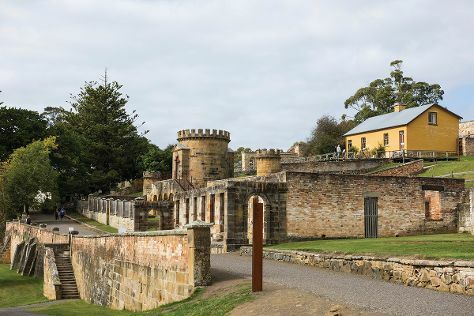 Get out of town with these interesting Port Arthur side-trips: Devil's Kitchen (in Eaglehawk Neck), Coal Mines Historic Site (in Saltwater River) and Denison Canal (in Dunalley). To see photos, reviews, where to stay, and more tourist information, refer to the Port Arthur holiday planner. You can drive from Hobart to Port Arthur in 1.5 hours. Another option is to take a bus. Expect a daytime high around 26°C in February, and nighttime lows around 14°C. Finish up your sightseeing early on the 28th (Thu) so you can travel to Orford. Orford is a village on the east coast of Tasmania, Australia 73 kilometres north-east of Hobart. Explore Orford's surroundings by going to Bream Creek Farmers Market (in Copping), Buckland (St John the Baptist Chuch & Tasmanian Bushland Garden) and Callington Mill (in Oatlands). There's much more to do: step off the mainland to explore Maria Island National Park, kick back and relax at Raspins Beach, get great views at Three Thumbs Lookout, and relax in the rural setting at Twamley Farm. To find ratings, photos, and more tourist information, go to the Orford trip planner. Traveling by car from Port Arthur to Orford takes 2 hours. In February, daily temperatures in Orford can reach 26°C, while at night they dip to 14°C. 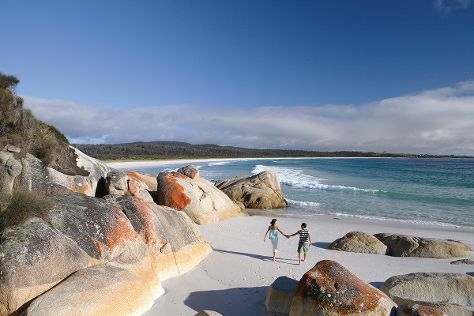 Wrap up your sightseeing on the 3rd (Sun) to allow time to travel to Bicheno. Bicheno is a town on the east coast of Tasmania, Australia, 185 km north-east of Hobart on the Tasman Highway, with a population of 853. 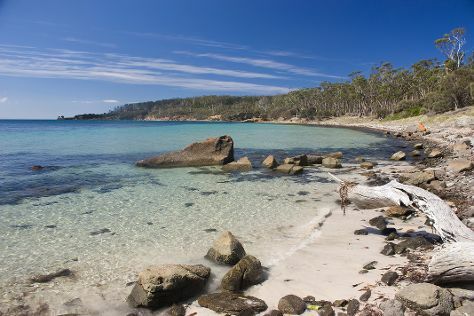 Change things up with these side-trips from Bicheno: Coles Bay (Friendly Beaches, Freycinet National Park, & more), Swansea (Spiky Bridge & Melshell Oysters) and Gala Estate Vineyard (in Cranbrook). There's still lots to do: enjoy the sand and surf at Honeymoon Bay, do a tasting at Devil's Corner Cellar Door, make a trip to Bicheno Blowhole, and stroll through Denison Beach. For photos, where to stay, traveler tips, and tourist information, use the Bicheno tour planner. You can drive from Orford to Bicheno in 1.5 hours. In March, daytime highs in Bicheno are 26°C, while nighttime lows are 11°C. Wrap up your sightseeing on the 8th (Fri) early enough to travel to St Helens. Explore the numerous day-trip ideas around St Helens: Blue Tier (in Weldborough), Pyengana (Pyengana Dairy & Holy Cow Cafe & St Columba Falls Reserve) and Legerwood Memorial Tree Carvings (in Legerwood). To see where to stay, maps, other places to visit, and other tourist information, read our St Helens road trip tool . Getting from Bicheno to St Helens by car takes about 1.5 hours. In March in St Helens, expect temperatures between 26°C during the day and 11°C at night. Wrap up your sightseeing on the 11th (Mon) early enough to travel to Launceston. Get out of town with these interesting Launceston side-trips: Rowella (Holm Oak Vineyards & Lavender House The Perfumery), Goaty Hill Wines (in Kayena) and Pipers Brook Vineyard (in Pipers Brook). 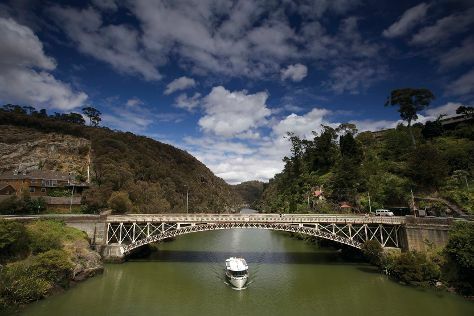 There's lots more to do: identify plant and animal life at Cataract Gorge Reserve, stroll through City Park, contemplate the waterfront views at Tamar River, and snap pictures at The Red Bridge. For reviews, maps, photos, and tourist information, refer to the Launceston trip itinerary planner. Traveling by car from St Helens to Launceston takes 2.5 hours. Expect a daytime high around 26°C in March, and nighttime lows around 11°C. Cap off your sightseeing on the 17th (Sun) early enough to go by car to Devonport. You'll find plenty of places to visit near Devonport: Beauty Point (Platypus House & Seahorse World) and Makers Workshop (in Burnie). And it doesn't end there: stroll through Coles Beach, explore the wealth of natural beauty at Narawntapu National Park, brush up on your knowledge of spirits at Southern Wild Distillery, and explore the stunning scenery at Leven Canyon. To find photos, where to stay, other places to visit, and other tourist information, read Devonport trip planning tool . Drive from Launceston to Devonport in 1.5 hours. Alternatively, you can take a bus. Expect a daytime high around 26°C in March, and nighttime lows around 11°C. Wrap up your sightseeing on the 20th (Wed) early enough to travel to Sheffield. Sheffield is a town 23 kilometres inland from Devonport on the north-west coast of Tasmania. Explore the numerous day-trip ideas around Sheffield: Gunns Plains (Gunns Plains Caves & Leven Valley Vineyard), Liffey Falls (in Deloraine) and Mole Creek (Marakoopa Cave, Mole Creek Caves, & more). 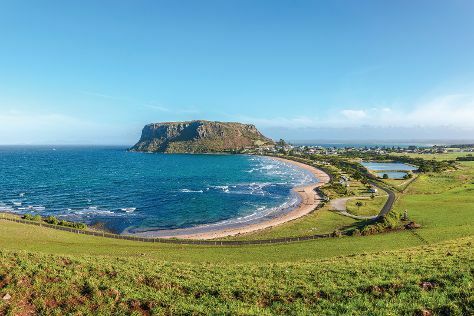 There's lots more to do: get in on the family fun at Tasmazia & The Village of Lower Crackpot, take in the pleasant sights at Tasmania’s Town of Murals, experience rural life at Ashgrove Tasmanian Farm Cheese, and take some stellar pictures from Alum Cliffs. For photos, reviews, maps, and other tourist information, read Sheffield itinerary planner. Sheffield is just a stone's throw from Devonport. Expect a daytime high around 26°C in March, and nighttime lows around 11°C. 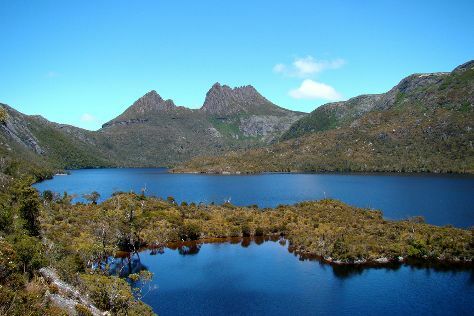 Wrap up your sightseeing on the 23rd (Sat) to allow time to travel to Cradle Mountain-Lake St. Clair National Park. On the 26th (Tue), hike the day away at The Overland Track. There's lots more to do: explore the activities along Dove Lake Circuit, trek along Cradle Mountain-Lake St Clair National Park, take your sightseeing to a higher altitude at Barn Bluff, and look for all kinds of wild species at Devils @ Cradle. To find more things to do, maps, ratings, and tourist information, go to the Cradle Mountain-Lake St. Clair National Park day trip planning tool . Traveling by car from Sheffield to Cradle Mountain-Lake St. Clair National Park takes 2.5 hours. Finish your sightseeing early on the 27th (Wed) to allow enough time to travel to Derwent Bridge. Derwent Bridge is a locality on the Lyell Highway at the southern edge of the Cradle Mountain-Lake St Clair National Park.It is just south of Lake St Clair and the Lake St Clair visitor centre; and it is north of Lake King William and the Butlers Gorge Power Station.It is also the last inhabited location before Linda Valley in the West Coast Range - this section of the highway passes through the Wild Rivers National Park. Change things up with these side-trips from Derwent Bridge: Tarraleah (Tarraleah Power Station Lookout & Tarraleah Falls). Spend the 30th (Sat) exploring nature at Franklin-Gordon Wild Rivers National Park. Next up on the itinerary: delve into the lush surroundings at Franklin River Nature Trail, appreciate the history behind The Wall in the Wilderness, take your sightseeing to a higher altitude at Frenchmans Cap, and look for all kinds of wild species at Franklin-Gordon Wild Rivers National Park. To see other places to visit, where to stay, traveler tips, and tourist information, use the Derwent Bridge travel planner . You can drive from Cradle Mountain-Lake St. Clair National Park to Derwent Bridge in 4.5 hours. Finish your sightseeing early on the 30th (Sat) to allow enough time to travel to Strahan. Kick off your visit on the 31st (Sun): stop by Wilderness Woodworks, then see the interesting displays at Morrisons Huon Pine Sawmill, then take in the dramatic scenery at Hogarth Falls, and finally kick back and relax at Ocean Beach. On your second day here, discover the riches below the earth's surface at Iron Blow Lookout, take a leisurely stroll along Horsetail Falls, see the interesting displays at Eric Thomas Galley Museum, then take some stellar pictures from Spion Kopf Lookout, and finally get outside with Henty Dunes. To find where to stay, reviews, other places to visit, and tourist information, use the Strahan trip maker . Traveling by car from Derwent Bridge to Strahan takes 2.5 hours. Wrap up your sightseeing on the 1st (Mon) early enough to travel to Corinna. Kick off your visit on the 2nd (Tue): take in the awesome beauty at Mt Donaldson. To find traveler tips, other places to visit, maps, and tourist information, refer to the Corinna visit planner. Traveling by car from Strahan to Corinna takes 2 hours. Wrap up your sightseeing by early afternoon on the 2nd (Tue) to allow time for travel to Arthur River. Start off your visit on the 3rd (Wed): explore and take pictures at The Tarkine Drive, then take some stellar pictures from Sumac Lookout, then identify plant and animal life at Arthur-Pieman Conservation Area, and finally don't miss a visit to Edge of the World. For more things to do, ratings, other places to visit, and more tourist information, read our Arthur River online itinerary builder . Traveling by car from Corinna to Arthur River takes 2 hours. Wrap up your sightseeing on the 3rd (Wed) to allow time to travel to Stanley. Stanley is a town on the north-west coast of Tasmania, Australia. Change things up with these side-trips from Stanley: Green Point Beach (in Smithton) and Wynyard (Table Cape Lighthouse Experience, Wonders of Wynyard Exhibition and Visitor Information Centre, & more). The adventure continues: identify plant and animal life at The Nut State Reserve, stop by Providore 24, don't miss a visit to Joe Lyons Cottage, and take in nature's colorful creations at Allendale Gardens. To find traveler tips, other places to visit, photos, and other tourist information, use the Stanley sightseeing planning app . Drive from Arthur River to Stanley in 1.5 hours. In April, plan for daily highs up to 20°C, and evening lows to 5°C. Wrap up your sightseeing on the 6th (Sat) early enough to travel back home.